I probably need to stop talking to my sister on the phone. And maybe phase out quick conversations with other moms at school. Because they are stealing my best material. I tell my funny, quirky, who-would-have-thunk stories to them, and then when I sit down to write for the blog (if I sit down and write for the blog), I'm all pensive. For the love of laughter. I keep saying this, but I promise: I am NOT this serious in real life. Let's just chat, shall we? 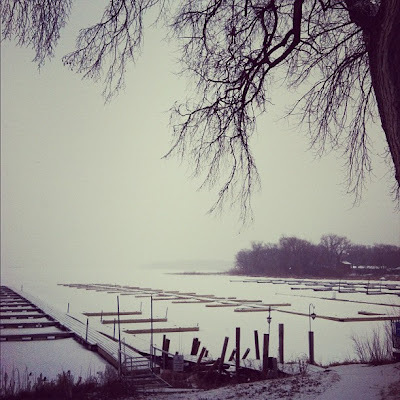 Let me do the first thing Midwesterners do if we sit down for coffee -- we talk weather. And this winter has left us with no end of details to discuss, because hello -- winter hasn't really arrived. We had a brown Christmas, we've been above freezing for much of January and we haven't had a plowable snowfall since December 4. But today, hallelujah, it's snowing! About freakin' time. If we're lucky, we'll get enough to cover the grass completely. But I'm not holding my breath. Keep in mind, this pitiful excuse for a winter follows last winter, which was the third snowiest winter in history for Minnesota. This time last year, almost 60 inches of snow had fallen already. Here. Let me show you a few pictures I took last winter, shortly after we moved into our new house. 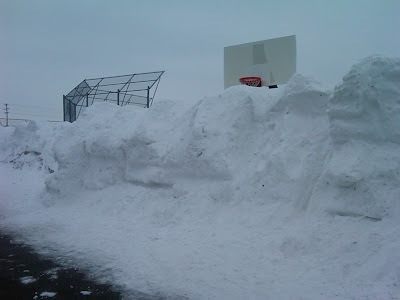 The snow drifts outside the kids' school last year. So. Pretty. I almost want to swoon over those photos. And this year? We haven't even gotten 12 inches of snow. Total. And most of that has come in dribs and drabs and then has melted within 24 hours. It's depressing. If you'd really like to be on Irony Patrol, consider that Seattle got six inches of snow this week. And I didn't want to move there because I didn't want to leave my snow. Don't you love that photo? The people of Seattle's Queen Anne's neighborhood converting the street into a giant sledding hill. That, right there, is why I love snow. Snow is magic. It calls to the kid in us and gives us an excuse to indulge the spontaneous and silly. Throw snowballs, make a snow angel, whoop it up on a sled that inevitably spills you into a snowdrift. It's allowable. Heck, it's encouraged. Mr. Snowman, bring me some snow. Pretty pictures. And that last picture is really fun. But I'm still happy to live in the land of little or no snow! 70 degrees right now! Sounds as though you are having the same "winter" we're having. Not fun at all! Well, it's about time we got some snow out here! December was the driest we've had since something like 1927. 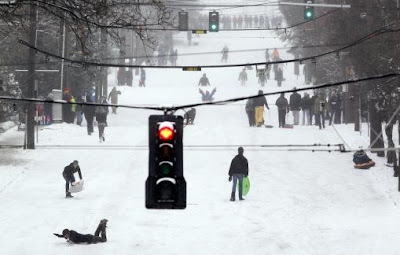 But no, you really don't want to live in Seattle when it snows. It's not pretty or fun no matter what that picture looks like. The hills are intense and it's slushy/icy snow. Wow. How can I give you a hard time if you aren't buried in snow?! We've been having even less winter than usual. It's already been 80 several days. That would be fine with me except I know it means we won't have good bluebonnets this spring or good peaches this summer, and it won't take much to get us back up over 100 this summer. Maybe it's all the hot air circulating because it's an election year. . . .
We haven't had much of a winter in N Ireland this year either! Not that we ever get much snow or ice but there has hardly been a flake. I don't miss driving in the snow but I love how it transforms even the ugliest scene with a sprinkle of fairy dust. The kids love it and the big kid in me loves it too! A day or two and then I'm over it, but doesn't look as if I'll even get the chance to get to that point this winter.